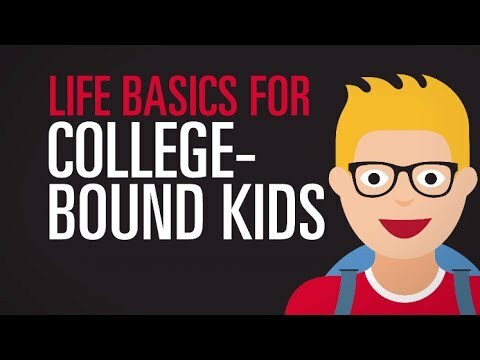 Discussing money, health and insurance basics can help college-bound kids manage classes, work and personal life. Set a budget. List income sources and separate essentials from the nice-to-haves. A banking app can help track spending. Check for local branches of your bank, or open an account at a bank near campus. Make sure vaccinations are up to date. Send copies of any relevant medical details with your student. Learn where college health services are and what's available to students. Check that your car insurance covers your student. Set a maintenance schedule and locate a close-by mechanic for repairs. Verify the family health insurance policy extends to college kids. If your student lives on campus, they are probably covered by your homeowners/renters policy. But if they live off-campus, renters insurance is a must. Try these tips for knocking down everyday expenses and socking it away safely. Help your child find the right scholarships, know their deadlines, and submit a strong application. Plus a few things parents of college students should be aware of regarding insurance. It's not going to be a big deal, but here are a few things that will be helpful to know. How should you save for your child's college education? Consider these plans. Review various inflation rates to see how much you can save.